Upgrade Your Proactiv Kit and Get your Proactiv Add-on at 50%-60% Discount! One thing nice about getting older is the tendency to get less pimples. I remember my younger years and how those annoying pimples would make me feel self-conscious. My friends had it worse and it was easy to see the effect on their self-esteem, especially during our early (kids can be quite vicious when it comes to teasing). I've been hearing about Proactiv for quite some time now, but I've always associated it with celebrities and socialities. Looking around the Proactiv site, I was surprised to see testimonials not just from celebrities but even from ordinary men and women. I know some people who want to try Proactiv products but are intimidated by the price -- they don't mind spending a bit more than they usually do if the product is effective but will feel terrible if they don't get any positive result. There's a money-back guarantee though, so there's less risk of paying for something that won't work for your skin. Proactiv currently has a promo for its clients residing in the Philippines. 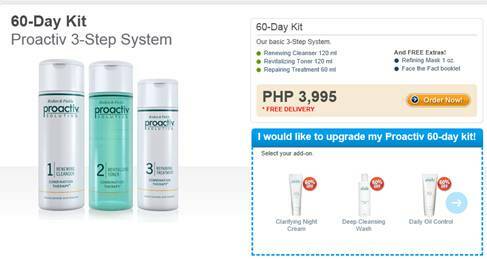 You can get a 50-60% discount on your Proactiv add-on if you buy your Proactiv kit through the Proactiv Online Shopping Cart until December 31, 2012. You get 50% discount on the add-on if you buy the 30-day kit while you get 60% discount on the add-on if you buy the 60-day kit. 1. 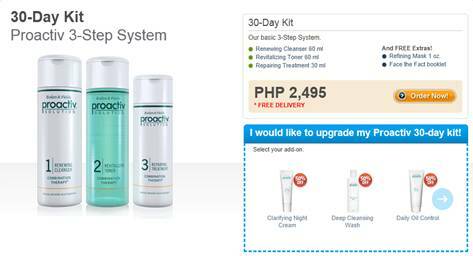 Visit http://my.proactiv.com.ph and register to have an account. 2. Choose either the Proactiv 30-day kit or the Proactiv 60-day kit. Choose your add-on on the lower right side of the screen. 3. After you have chosen an add-on, a pop-up screen will appear showing you the add-on's discounted price and the total package price of the upgraded kit. 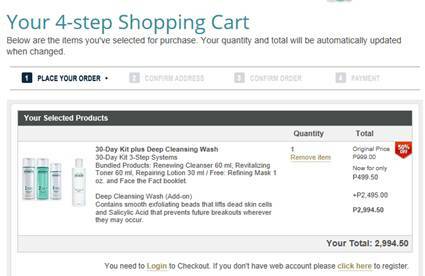 You can then add the upgraded kit to your shopping cart. 4. Proceed to checkout to finish your order. Payment can be via credit card or COD. All upgraded kits will be delivered with no delivery charges. 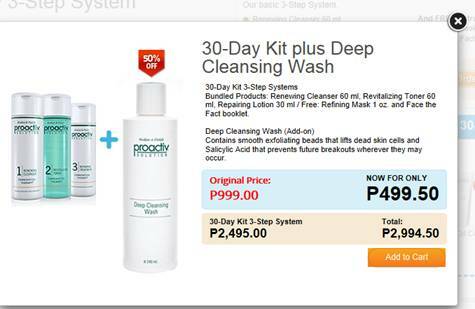 For more info, you can also visit Proactiv Solution Philippines' Facebook page. My experience is the other way around, I had breakouts when I got pregnant and until now I feel uncomfortable with my skin. Looks like this is a promising product so will definitely try soon. I am an advocate of skin care. But I also would love to emphasize that before taking on any skin treatment, it would be great for someone to seek medical help first. A doctor just might diagnose any illness that might be contributing to acne, such as polycystic ovarian syndrome. :) And sometimes, even topical medication might not be enough and oral treatment may be indicated. i have friends who tried it and it actually works... its hard nowadays to find a great product of all thats available in the market... thanks for this post! My wife use Proactiv products and now I the reasons why. Thanks for the info.